Five friendly bears for your yard or patio. All projects are made from standard lumber sizes and all patterns are drawn FULL SIZE. The #W1858 Bear Bench (18"H) and the #W2165 Bear Table (24"H), each require one pair of #3221 brown eyes. The #W2053 Bear Cubs require 2 pair of #9915 brown eyes and two #1266 flower pots. The #W2296 Welcome Bear (84"H), holds a fish which says Welcome on one side and Gone Fishin' on the other. Order #3289 Hardware Parts Package for this project. 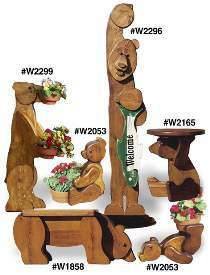 The #W2299 Bear Planter (48"H), holds 3 flower pots. Order #1641 Hardware Parts Package for this project. For long lasting results, finish all bear projects with an outdoor rated stain like Sikkens Cetol 1 dark oak color finish. Order plans and hardware separately or check out the Specials for great savings. Special #1629 includes #1641 Hardware and plan #W2299. Special #1634 includes #3289 Hardware and Plan #W2296. Special #1558 includes 4 pots, 8 brown eyes and plans #W1858, #W2053 & #W2165.